Say goodbye to pesky fruit trees! Crab apple trees that are proving irresistible for Banff bears could soon be a thing of the past. On Monday night, town council agreed to set funds aside that would help homeowners pay for tree removal and replacement on their properties, reports the Calgary Herald. The move will see $6,000 of a $21,000 program set aside. This will allow approximately 25 homeowners to replace their crab apple and chokecherry trees with foliage that's less desirable to animals. The program will be jointly funded by the Town of Banff and Parks Canada. 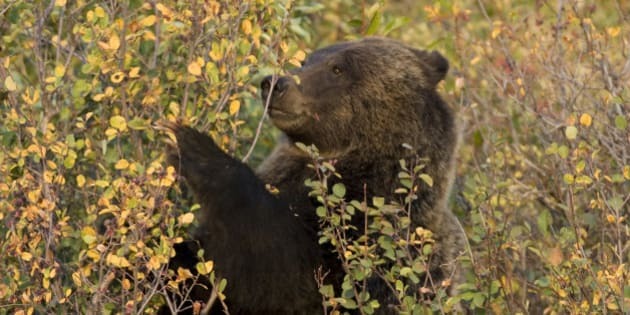 Both Banff and other nearby mountain towns have been asking residents to either keep up with collecting the fruit from their trees, or consider removing them altogether, to keep bears away from human populations. In Canmore, a bear was euthanized earlier this month in the Cougar Creek area after repeatedly getting into fruit trees. Another bear was also euthanized in Banff this August after spending days and nights feeding on chokecherry trees. As well, other bears have also been captured and relocated to other parts of Alberta, after entering Bow Valley towns in search of fruit. "The life of a bear isn’t worth having a pretty tree," John Paczkowki of Alberta Parks told the Calgary Sun earlier this month. Paczkowski also told the Rocky Mountain Outlook that fruit trees inside town limits are the "last piece of the puzzle" in Canmore's progressive bear management plan.